The immune system is best known for protecting us from infectious pathogens like viruses and bacteria. To do this, the immune system identifies molecules that are unique to that specific microbe so that it knows what to attack. You are able to fight off the infection and become immune only if the immune system does this properly. If it doesn’t get it right and instead identifies an inappropriate molecular target to attack, serious chronic diseases including allergy and autoimmunity can result. Our research aims to understand how the immune system determines what molecular targets (called antigens) to attack. T cells and B cells are two kinds of immune cells that share the job of antigen recognition, although they go about it in very different ways. Despite this, T and B cells collaborate with each other throughout an immune response through direct interactions between cells that recognize the same target. The outcome of these interactions determines how the immune response develops. In the KerfootLab, our goal is to understand how B cells and T cells work together to drive and maintain an immune response. Our investigations of the fundamental mechanics of immune responses to different antigens inform our other research projects looking at how these same processes can drive chronic autoimmune disease. See below for a brief description of these two branches of our research and how they are interrelated. One branch of our research aims to understand how interactions between T and B cells promote the initiation of a new immune response targeting a specific antigen, and how signals shared between the interacting cells influence the nature of the developing response. To do this, we use model antigen systems that allow us to control and manipulate the pairing of T and B cells that recognize different antigens. We then use different types of microscopes to observe interacting T and B cells in tissues. This includes a fluorescent microscope that allows us to take large, tiled images of entire tissue sections. This is important so that we can understand these important immunological events in their anatomical context. We also have one of the most advanced multiphoton confocal microscopes in the world that allows us to directly observe cells as they are interacting with each other in living tissues. So far, we have learned that the type of antigen target can dramatically influence the fate of the B cells involved in the immune response. We are now trying to understand what signals are communicated between interacting T and B cells and how they influence the outcome. Multiple Sclerosis can be a devastating, chronic disease and it is thought to result from the immune system mistakenly attacking proteins in the brain and spinal cord. If you want more information about MS and MS research in Canada, check out the excellent and approachable information on the Multiple Sclerosis Society of Canada website. Our research asking fundamental questions about how the immune system works has lead us to believe that interactions between T and B cells specific for a self-antigen may not be as strong as those between T and B cells specific for normal, non-self antigens. This means that they may be more susceptible to interference while leaving the “good” interactions intact. 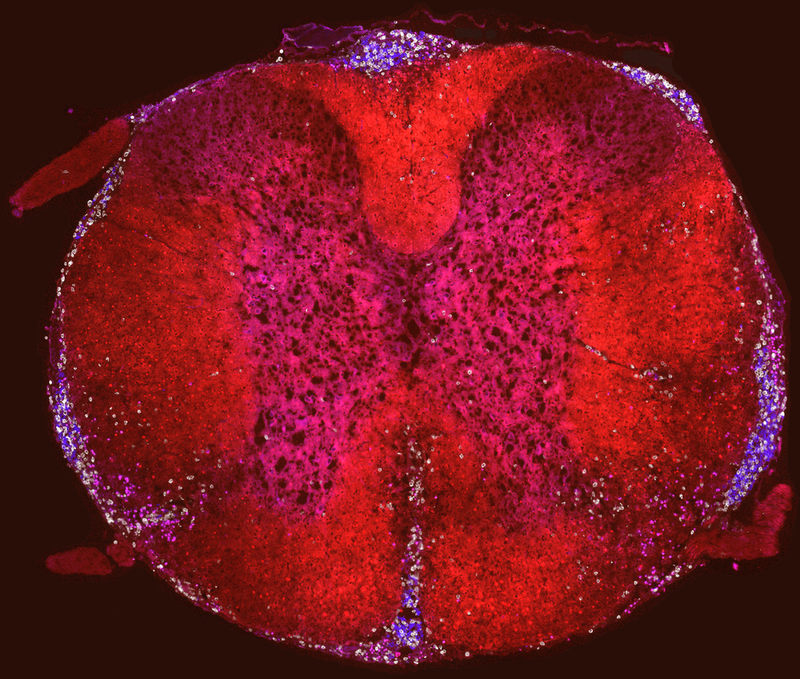 We are also investigating the B cells that invade the brain and spinal cord in anti-myelin autoimmunity. B cells have been observed in brain tissue from Multiple Sclerosis patients, and we find similar B cells in our animal models of disease. Our initial studies showed that brain and spinal cord-invading B cells have a unique profile, and may drive disease by different mechanisms than we originally thought. Our research is now focusing on understanding what is unique about these cells and what role they are playing in the inflamed tissue. Collaborating with other lab and clinical researchers is an important part of what we do. Working together lets us address research problems that we could not approach alone, lets us help other scientists ask their own research questions in new ways, and lets us translate what we learn in the lab to real world clinical outcomes. Intravital Multiphoton Microscopy: Using our cutting-edge multiphoton confocal microscope, we are developing a facility to help other scientists study biological events inside living tissue. This includes looking at brain injury and repair, vascular changes associated with nerves and drugs, and other projects. London Multiple Sclerosis Clinic: We have an important relationship with the clinical researchers at the London MS clinic. We help them analyze immune responses in people, and we have the opportunity to translate our findings using animal models of disease to Multiple Sclerosis.